I made these rings for my husband and myself! They were made by twisting together and then heat fusing a thick 18k yellow gold wire and a thick sterling silver wire into a single rod. I then cut this fused rod into 2 pieces and made them into rings. I hammered the bands to add texture and added a shallow diamond to mine. We both use our hands all the time so it was important that these rings not be too bulky. and we liked the idea of the 2 parts "fusing" together as one. It was fun to make our rings and these are the first wedding rings I ever made. Since then I have many more of all different sorts. 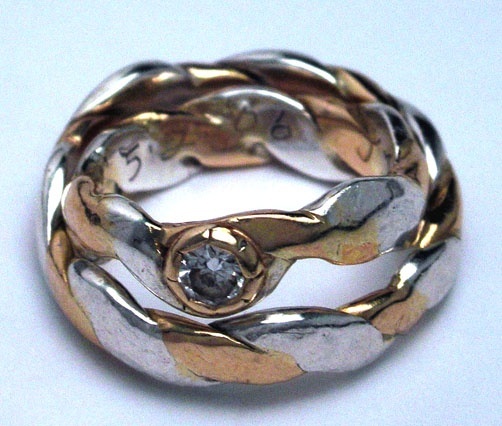 I really love making wedding rings and I am always so honored when asked to do so.